The Allweld Defender™ Impact Double Hung and fixed Picture Window systems are designed and tested to do just what their name implies, to defend your home from the destructive forces of nature. The Defender™ Impact Resistant Window is designed and tested to remain intact even after being struck and broken by flying debris, preserving the integrity of the home's interior and preventing the entry of hurricane force winds. Unlike Metal shutters or other window protection devices that must be installed over your windows in the event of a storm, the Defender™ window provides effortless protection for your home, even when you're away. With the Defender™ Window, there are no external brackets or other unsightly hardware to corrode and spoil the exterior beauty of your home as is common with removable storm panels and shutter. Fusion welded frame and sash. Triple Fin Seal weather-stripping in vertical jambs for air leak protection. Cam action sash locks. Two locks are standard on windows over 24" in width. 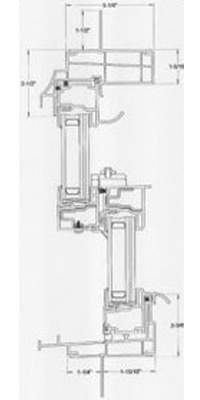 Night Latches allow ventilation of window without allowing bottom sash to be fully raised. In this test the window is subjected to two impacts from a nine pound two by four traveling at fifty feet per second. The tough laminated glass shatters, but the special urethane glazing holds it firmly in the frame, even after being repeatedly subjected to hurricane force wind pressure. 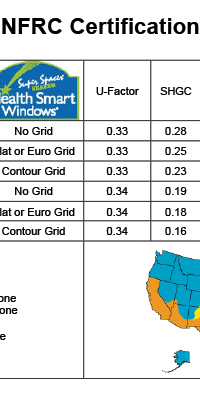 Full One-Inch Insulating Glass provides important benefits over ordinary single glazed impact windows. Insulating glass provides better energy savings, reduces the level of outside noise entering your home, and allows you the freedom to use any of our grid-between-the-glass (GBG) options to customize the look of the Defender™ to your home. 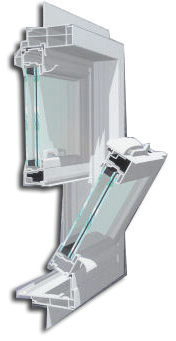 Both double hung sashes tilt in easily for safe cleaning from inside the home. Many impact windows rely on pocket jambs for strength, making tilt-in sashes impossible or are single-hung only and may require replacing the entire window if damaged. The advanced engineering used in the Defender™ frame design provides a sill that is so resilient that reinforcements and fasteners through the sill are not necessary, substantially reducing the possibility of leaks. Defender™ Vinyl Windows never need painting or routine maintenance, other than a periodic cleaning with ordinary soap and water. Defender™ Vinyl Windows are custom made to fit without any damage or alterations to existing interior trim. Shuttered windows prevent light from entering your home, making it dark and dreary, especially during power outages. The Defender™, on the other hand, allows the natural light to stream in, while at the same time giving your home the defense it needs. Vinyl Face Fins for exterior overlap installation.